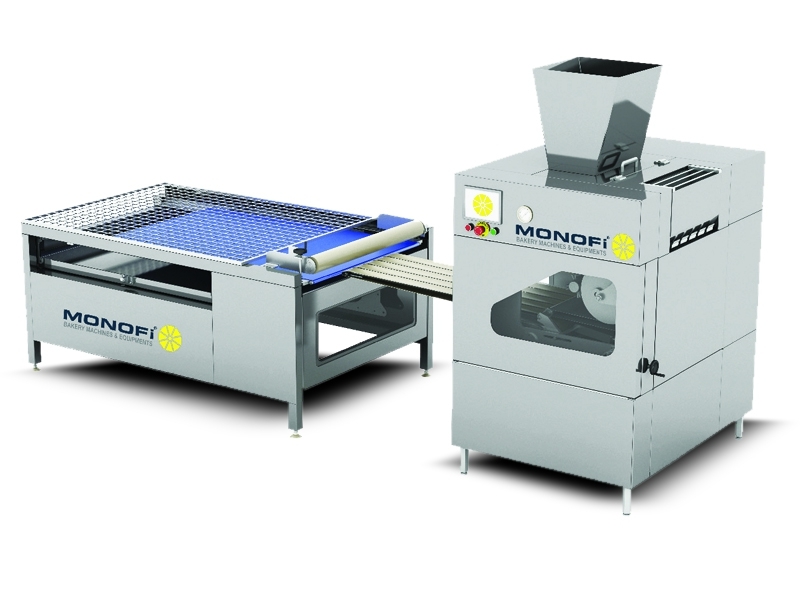 The fırst machine of the Roll series is the unit of dough divider and rounder; this unit never destroys the structure of dough and uses hydrolic pressing, provides precise and balanced weight adjustment, and has a rounding mechanism that simulates the handmade rounding.lt draws attention with replaceable rounding drum to provide various weights of rolls, adjustable flouring system, electronically adjustable dividing and rounding speed, strong chassis and lubricated gear box. The second unit of the production line is aligning unit and it runs on pull beck basis. The form of the dough is never destructed and it is possible to make too much work in very short periods since pull back action is very fast. The panel strip is designed as to make possible to make use of ali kinds of pans. This unit works fully integrated with the dividing unit and it is controlled with a control panel placed on dividing unit and the dough aligning distances and the pan sizes are also controlled with this control panel. Hamsa Roll production line is manufactured with materials that are compatible with food production regulations and eguipped with full safety mechanism to provide work safety.